In order to prevent the German Wirehaired Pointer from causing a ruckus inside of the home, a daily outlet in the form of physical activity is necessary. It is a natural hunter, so it is instinctively responsive but may also be stubborn. The German Wirehaired Pointer has a protective nature towards those it bonds with, so it may be standoffish or aggressive towards strangers or other unknown dogs. It is a good choice for a family dog, as it tends to do well with children, but can occasionally be slightly over energetic around them. 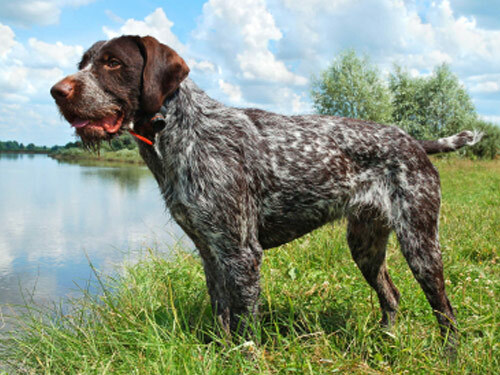 Ideally, the German Wirehaired Pointer would fit best with an owner who loves the outdoors and wants to spend a significant amount of time each week taking the tireless breed along with them to the outdoors. In order to fulfill the exercise needs of the German Wirehaired Pointer, a minimum of one hour per day of physical activity is suggested. Ideally, exercise would be mixed with a day in the field to hunt or run to fully meet the physical needs of this breed. The German Wirehaired Pointer loves to be around people and is an excellent family pet. It is important to make sure it has access to outdoors if it is primarily a housedog. The coat needs maintained through brushing approximately once per week, but may require occasional hand-stripping. Typically the German Wirehaired Pointer sheds minimally. The major health concern for the German Wirehaired Pointer is referred to as Canine Hip Dysplasia, or more commonly known as CHD. This involves an abnormality in the development of the hip. A minor concern for this breed is hypothyroidism, which is a disorder of the thyroid gland. Occasionally seen in the German Wirehaired Pointer are seizures, entropion, elbow dysplasia, heart disease, and gastric torsion. In order to keep this breed healthy, regular testing of the hip, elbow, cardiac system, and thyroid is recommended. The average life span of a healthy German Wirehaired Pointer is 12 to 14 years. The pursuit of a breed that could be versatile in the fields for hunting by locating and tracking game, confronting vermin, and retrieving game from land and water reached a high point in Germany. As these versatile and specialist breeds became available to hunters of average incomes, they desired a breed that could be successful in various types of rough terrain. Thus, the German Wirehaired Pointer was developed and became the versatile hunting companion that the hunters were looking for. Originally known as the Drahthaar, the German Wirehaired Pointer became and still remains one of the most sought after hunting dogs in Germany. It was derived from a combination of the Pudelpointer, early German Shorthaired Pointer, Griffon, Stichelhaar, and Polish Water Dog. Germany did not recognize the German Wirehaired Pointer as its own breed until the 1920s, which is the same timeframe that the breed arrived in America. While the breed was recognized in America in 1959, it has not enjoyed the same level of popularity there as it has in Germany.